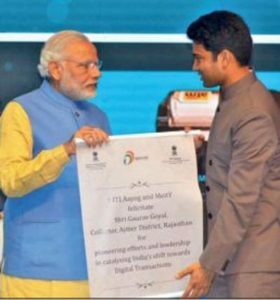 Prime Minister Narendra Modi conferred the prestigious Scroll of Honor award to Ajmer District Collector and Commissioner of Ajmer Development Authority (ADA) Gaurav Goyal on last Friday for encouraging cashless transactions in the district. The award was given for plethora of measures taken by the Collector post demonetisation to encourage cashless transactions and ensure law and order. According to Goyal after demonetisation, bankers and different organisations came to support the cause. In Ajmer district, 26 villages including Harmada village of Kishangarh block have become cashless. Our team work, coordination and management led to the success, he said. “Ajmer is the only district in Rajasthan selected for this award. We have encouraged the booth operators of dairy to opt for digital payment and created awareness for the same among those involved in dairy business. We have also been successful in payments to teachers and other involved in the conducting exam of gram sewak and hostel wardens of hostels in digital way,” said Goyal. The biggest achievement Collector made was to active 3.5 lakh RuPay cards out of 5 lakh cards by activating the machinery in rural areas. Secretary Ujjwal Rathore, Chief Engineer Arvind Araya, President of ADA employees Union Charanjeet Mahawar and Secretary Lokender Sharma and others welcomed the commissioner after the national award.